Today's article is brought to us by Joe Cook known as Cebronix on the site. Joe is the artist/creator of Shattered Myth. Joe also works in a print shop doing things like making T-Shirts for a living (amongst other things I'm sure). So we're lucky to have someone with his experience sharing with us. This is part two of a series. Part one can be found here. Direct Print is the process of dropping ink directly onto the threads of the garment. One of the main benefits of Direct Print is you can get a little bit more detail, a few more fine lines, a few more shadows, etc. 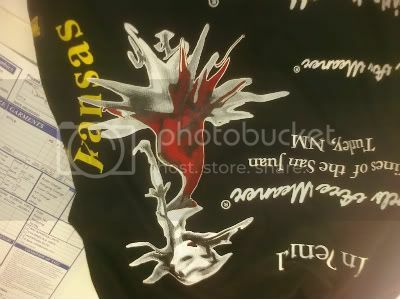 This is because the ink doesn't have to survive the trip onto the transfer paper and then survive the trip from the transfer paper onto the shirt. However there are limits. As all fabric is basically a mesh, super fine details will not show up unless you plan to print on 600 count Egyptian Cotton. The negative is that it has to be done when you place the order; which we'll discuss later. Heat Transfers are basically high quality "Iron-Ons." It's the same ink as Direct Printl; only it is printed onto release paper and is then reversed. The quality is almost the same, it adhears the same and lasts just as long. 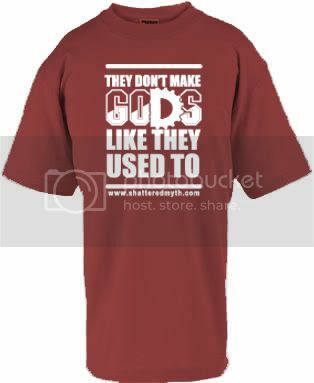 It's also less expensive because you can just order the transfers and add the shirts as needed. That way your up front cost is only for the transfers and you pay for the shirts as they are ordered. Thermo Prints are similar to sports shirts with jersey numbers. Ok, they are the jersey numbers. If your design is simple and you're ok with some texture from the shirt showing through the design, some places will just cut the material to the shape and apply it directly to the shirt. This is a good option for basic shirts ordered in one's or two's but many places don't offer this option. We'll try and keep this one short. Most webcomickers know the differences here. POD gives you the benefit of no overhead, no inventory, no store to set up and no expenses. You submit your layout to the POD company, then they tell you to re-do the layout (or you pay them to fix it). Then, once accepted, you set some ground rules for sizes, colors and pricing and you're done. Just promote the crap out of it and hope for some sales. The trade off is your profit margin. The POD company handles everything from there but it costs you. You may not see the cost as an out of pocket expense, but the cost is there in lost profits. If you keep the retail cost of your shirts within generally accepted pricing you're likely to only make $2-$3 per shirt. Cafe' Press and Spreadshirt are good examples of this kind of service. If you are just starting out with merchandise for your webcomic this is an excellent way to test the market without putting out a ton of cash for inventory and risking getting stuck with a bunch of unsellable shirts. Bulk printing is a whole different animal. This requires placing a large order for shirts involving minimum orders (usually 12-30) and some serious out of pocket expense. You not only submit your design (and you better make darn sure it is correct), you order specific quantities of specific colored shirts of specific styles in specific sizes. The logistics of it are astounding. You can limit the shirt styles available and keep it down to certain colors (make sure they work with your design). However, you have no way of knowing what sizes your readers are going to order. Pre-orders are popular but you shouldn't count on them to get you up to the minimum order. Not only that but now you have to maintain an inventory; a taxable inventory. You have to have a place to put them all. You might even find yourself at some point offering a clearance sale just to get rid of some of your shirts before you get taxed on them. It starts to get complicated. And of course you have to deal with shipping. On the other hand, your profits per-shirt will soar. You can expect to now make between $10-$15 per shirt. Quite the jump, but with the addition of a lot of work and even more risk. Your initial expense covers the cost of the prints, the shirts and the shipping to you. One other thing to keep in mind is that many print shops offer bulk discounts on both the printing process and the shirts themselves. So the more you order the less you pay per shirt. So it's often a lot more profitable to have just a few really well selling designs than a whole bunch of different shirts. These are the services offered by your basic shirt shops found all over the world. Fullfillment centers are a sort of middle ground. 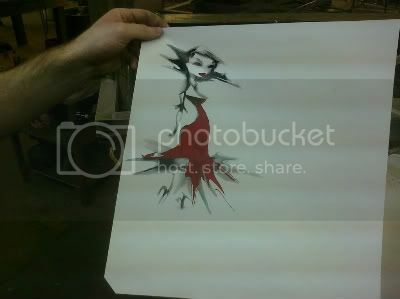 You submit your design and order a certain quantity of "Prints" of it. These are heat transfers (see above) that the center produces at the time of the actual order placement. You pay for these transfers and the fullfillment center holds them until an order comes in. The transfer is then applied to whatever size/color of shirt is ordered and it is drop shipped to the actual customer. The fullfillment center then pays you the difference between the retail sale price plus shipping to the customer and what you paid for the print. So if your print cost you $12 and the shipping cost was $4 and the total sale cost of the shirt was $24 then you would get $8 in return in profit (sales taxes are usually your problem to figure out and you should be careful if you are selling a lot). You can expect to make about $7-$8 per shirt going this route. This is a nice option to keep your initial expenses lower (you don't pay for the shirts, just the transfers) and still gives you one of the benefits of a POD company, with significantly better quality and customer service (usually). No Inventory. That means you never have to worry about having the right size and you never have to worry about being taxed for said inventory. Some shirt shops offer this as an option to good customers. Topataco. Having never dealt with them, I'm not 100% sure how they work or what model they follow. The reason I don't know is because you have to be an approved artist for them to carry your stuff. That usually means some level of success in the webcomicking industry. They won't accept orders from un-established, smaller guys. At least not yet. They seem to handle everything as if they were a fullfillment company, but they don't even actually print their own shirts. Those are provided by another print shop and Topataco is just the middle man. As I said, I am unfamiliar with them as I'm not "in the club" so I'm just speculating here. If anyone else knows of some other options, feel free to leave some comments here and we can all discuss them further. [Editors Note: Topatoco is a fulfillment center in the purest sense of the word. The example of fulfillment centers in this article actually refers to fulfillment center/print shops; where the transfers are made and stored on site and used as orders come in. 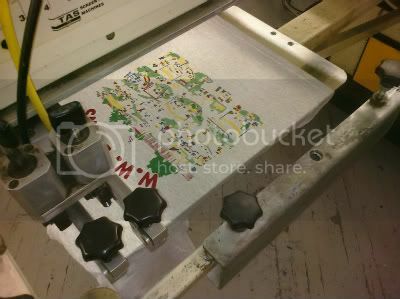 Topatoco deals with a bulk order printer named Brunetto T-Shirts in Southington, Connecticut. They bulk order the shirts, have them delivered to their office in Massachusetts (or maybe they pick them up I don't know; it isn't that far a drive but with the volume they move I tend to think a large truck and a loading dock is involved) and then fill customer orders as they come in. Since they deal with a bulk order printer who has minimum order requirements it makes sense they would restrict their service to webcomics with a proven sales history. It keeps them from getting stuck with a bunch of unsellable shirts. I have actually dealt with Kurt Brunetto myself on a small order for some Remedial Comics/Remedy shirts and I can tell you that he is an incredibly kind, patient and helpful guy and his shirts are just the best quality ever. There is a reason Topatoco uses him. If you are ever in a position to make a bulk order I highly recommend his services. His minimums are pretty low, his prices are reasonable and the more you order the more the shirt and cost of printing get discounted. I only bought 12 shirts with a one color print on them on the front and back but I would not hesitate to use him again should the need/opportunity arise. In part three we will cover the process of preparing a raster image for the printing process by converting it to a vector. Check back Wednesday for an article directly related to part three. I think you will be glad you did.